Islamabad’s home to beautiful species of birds and thanks God we are not chirra-eaters like Gujranwala people *_* (no offense). Margala hills itself is abode to many rare-sighted birds. I confess being part of killing a Blue Finch once, during a air-rifle shooting practice. 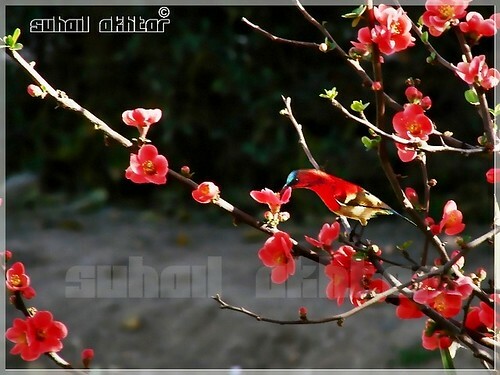 But I’ve never ever seen this Sunbird, so royal in its colors, in Islamabad ever. Glad that the photographer managed to shoot it. Beautifully camouflaged as well. Red Sunbird, originally uploaded by Suh@il << Busy & Away >>. Do you have an eye for nature? Asma, if you ever eat a chira, you will never eat murgee again. It is "finger lickin’ good"! BTW, I share your enthusiasm for birdy slaughter. I once pushed a nest containing four pigeon babies out of the 3rd floor window a long time ago when I was a little monkey. This Asian Study Group thingy seems to be quite active in Islamabad. Wonder what else they keep themselves busy with. i once bought an air gun, just for the sole purpose of hunting birds, but i never got a chance to shoot one, although i tested it on a crow, but the gun wasn’t zeroed then and the lucky one got away. ..
the picture is awesome but reminds me of that add. on PTV, which says "Shoot with camera not with gun". This is what Islamabad is all about.